Today was a momentous day in the kitchen. Ok, well, not that momentous. I made my first full recipe from my Smitten Kitchen cookbook — a Christmas gift from my darling brother and co-blogger, Edward (I also made challah French Toast– to be posted at a later date). I’ve adapted recipes from it a couple times before and of course, I’ve made things from the recipes on the Smitten Kitchen blog. But today was the first time that I said, gosh darn it, who cares if sesame seeds cost a fortune — I’m making this recipe! 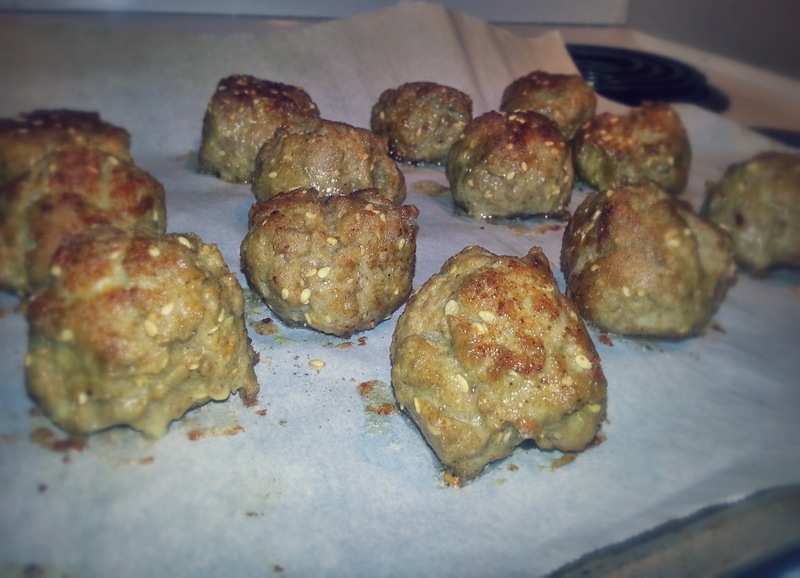 And I am very grateful that I did because these meatballs are AMAZING. Like mouth-watering good. Pre-heat oven to 400 degrees and cover your baking pan with parchment paper. Mix all the meatball ingredients (everything except the oil for the pan) in a large bowl. I used my hands because squishing things is fun. But you can use a fork too. Start making balls out of the meat mixture as the oil heats. They should be about 1 inch in diameter. 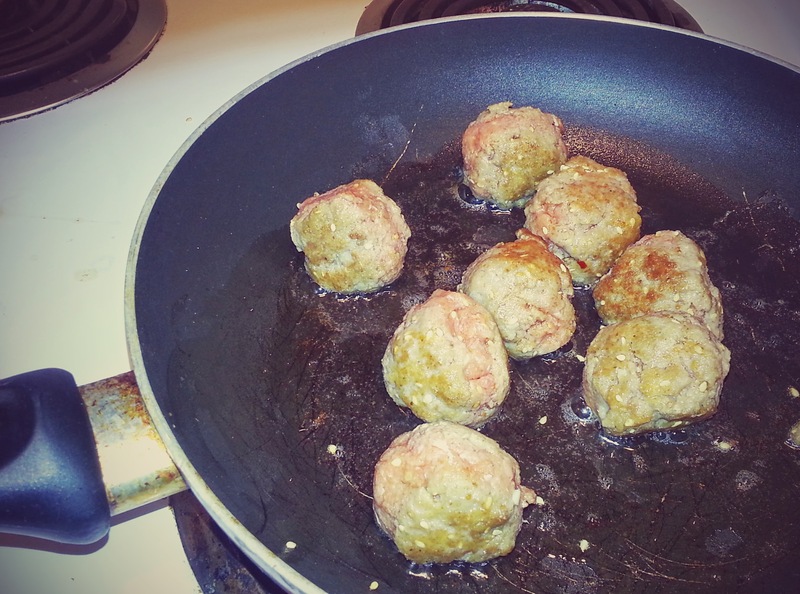 Brown the meatballs in oil. This will require moving them around a bunch to get all the sides browned. Don’t worry too much about how golden delicious they get though — they’ll brown more in the oven. During the ten minutes where your meatballs are baking, you can make a delicious yogurt sauce for them. This also could be made ahead of time. No, that’s it. I just felt like I couldn’t have only one thing under instructions. Now eat it! I recommend putting the sauce and hummus in the pita first and then adding the meatballs and spinach. I usually fit 2 and a half meatballs per pita half and I was using Arnold’s brand whole wheat pitas. Also, once the meatballs are in the pita, squish the pita so that the meatballs break up and the sauce gets in all the nooks and crannies. Protip from Brandon: buy sesame seeds at Asian stores where they don’t cost a jillion dollars. What are the orange-red chunks in the picture? I made these! They were good, but I think I would cut the lemon juice in the yogurt sauce in half. I used naan, because I can’t seem to find good pita around here. I also made my own hummus.